Apple has unveiled new functionality for all apps in their App Store. Developers now have the option to offer promo codes to unlock all fremnium content within their apps. This is a boon for game testers or the media to give an accurate review of all the ingame content. Promotional codes have been available for quite awhile. In the past, they were only relevant to downloading a paid app for free. This prevented companies like Zinio or PressReader from giving away free digital magazines or newspapers as part of a promotion. This new feature is not available yet to all developers and Apple has not updated their main portal yet with all of the latest information. 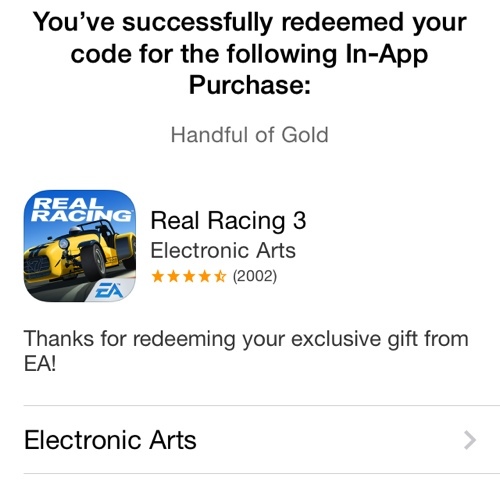 The big app developers have been the first ones to get early access, as evident in the Electronic Arts game Real Racing 3. The company is currently offering a promotion to get 10 gold, worth $1.99, for free. Games that offer microtransactions like Simpsons Tapped Out or Clash of Clans stand the most to gain. They constantly run television commercials that would allow them to give in-game currency away for free and evaluate if their campaign was successful. I think eBook, newspaper and magazine companies stand to gain the most. Being able to give a few things away for free is a compelling value proposition. For example, there is a ton of companies out there that do the whole Netflix for eBooks or Netflix for magazines, a good way to distinguish yourself is to give away free content. These new promotional codes are a boon for the publishing industry.